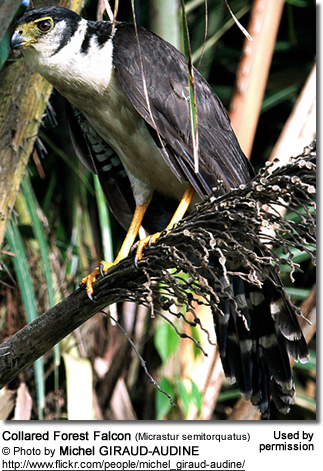 The Collared Forest Falcons (Micrastur semitorquatus) - also known as Collared Micrasturs or Pied Forest Hawks - are large, distinctive falcons found in the tropical forested areas of the Americas, where they are believed to be mostly resident (non-migratory). Range: Eastern Colombia east to the Guianas, and south through eastern Peru, northern and eastern Bolivia and Brazil south to Paraguay and northern Argentina. Range: From the northwestern Mexican state of Sinaloa to the northeastern state of Tamaulipas, south through Central America to northern and western Colombia and Ecuador. Collared Forest Falcons generally occur along the edges of humid lowland rainforests, swamp forests and mangroves; but - in the more arid parts of their natural range - are found in semi-deciduous, deciduous and riparian forests. They typically remain high up in the canopy. The Collared Forest-Falcon - the largest member of the Micrastur genus - occurs in three color morphs: pale, dark and tawny. The pale and tawny morphs have a pale collar across the back of the neck from which its common name has been derived. This collar contrasts strongly with the dark upperparts. They nest in tree cavities and other cavities, such as holes in cliffs, caves and abandoned buildings. A clutch consists of 1 - 3 (mostly 2) white eggs heavily spotted with tan, brown, and chocolate. The female alone incubates the eggs for 46 - 48 days, while the male delivers food to then nest. As soon as the nestlings can be left alone for short periods, the female will also hunt and feed the young. The juveniles fledge when they are about 50 days old. The parents will continue to feed them for several more weeks until the young are fully independent. The Collared Forest Falcons feed on various small mammals (including rodents), birds (up to the size of ibises), large lizards, snakes and large insects. Most hunting occurs at dawn and dusk. They appear to locate their prey by their well-developed sense of hearing and large eyes. They ambush prey from concealed perches, but have also been observed running prey down on the ground. Their repetitive, resonant calls are described as a human-like "AW". They are most vocal in the early mornings and evenings.